Looking for wedding or shower favors that are simply charming? Your guests will LOVE these wine charms. 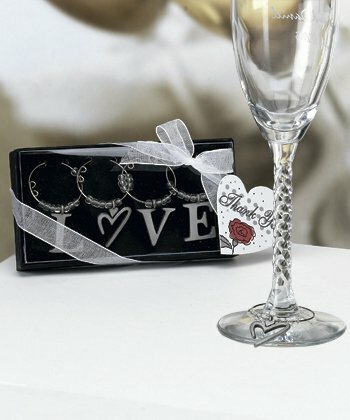 It`s fun to charm your guests with these whimsical wine charms as wedding or shower favors for them to take home. Each of the four wine charms is adorned with beads and a letter that, when together with the others, spell out the word LOVE in a modern, stylized fashion. Each set of wine charms comes individually packaged in a deluxe gift box tied with a white organza bow and finished with a heart shaped thank you tag.